Literally “absorb” the smells and odors from the area! These work great for neutralizing tough smells in basements, living areas, or anywhere else that needs freshening. This special formula absorbs all sorts of unpleasant odors. Simply remove the lid, lift off the foam seal, replace the lid, flip open the top and odors begin to disappear. It continuously eliminates odors from smoke, pets, cooking, mildew, restrooms and more. Designed to be strategically placed anywhere recurring odors are a problem. Eliminates odors in rooms up to 450 sq. 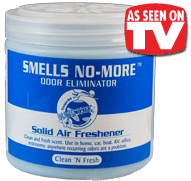 ft.
For further odor elimination, follow-up as necessary with our full line of non-toxic SMELLS NO-MORE! Odor Eliminator spray products.